Paul J. Marchetti was born in Italy in 1889. In his adolescence, he became interested in machines, engineering, and aircraft. In 1910, when he was 21 years old, Marchetti emigrated from Lucca, Italy to the United States in search of greater opportunities. He worked his way west and supported himself as a logger, all the while dreaming of entering the aviation business. The Marchetti eight-cylinder, cam-action aircraft engine of 1927. Note the stagger of the front and rear cylinders. Unfortunately, there is little information about Marchetti, his life, and his inventions. By 1922, he was working with Henry A. Nordwick in Stockton, California. 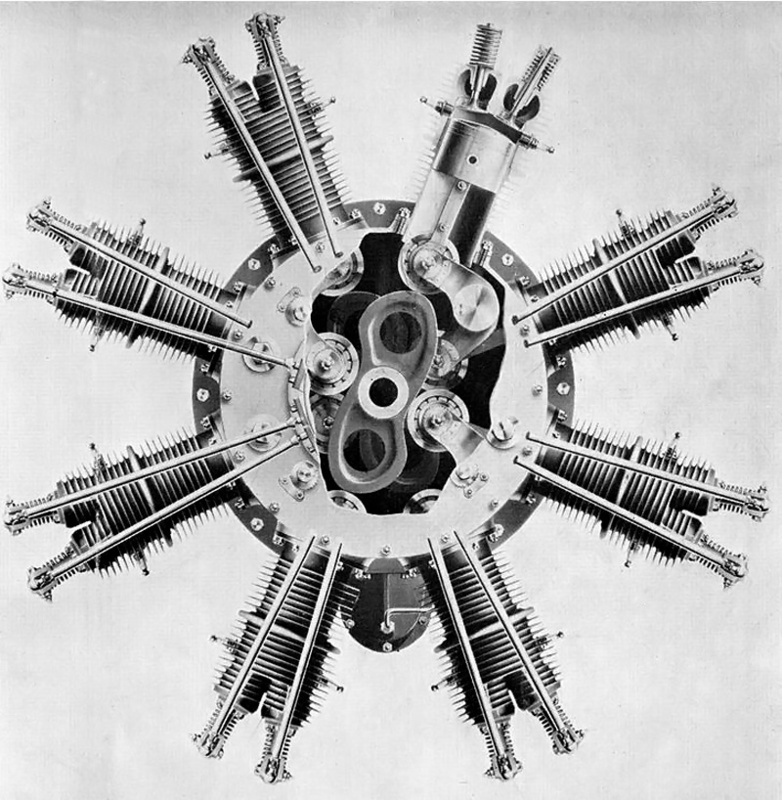 Nordwick was working on designing a radial engine in which the crank throw was replaced by a cam with four lobes. A roller on the big end of the connecting rod made contact with the cam, its points creating the piston strokes. Another Nordwick and Marchetti engine design dating from 1923 had the big end of each connecting rod attached to its own crank, which was geared to a main central gear. By 1924, Marchetti was in San Francisco, California and filed a patent of his own for a broad-arrow engine using either a three- or four-lobe cam in place of the crankshaft. 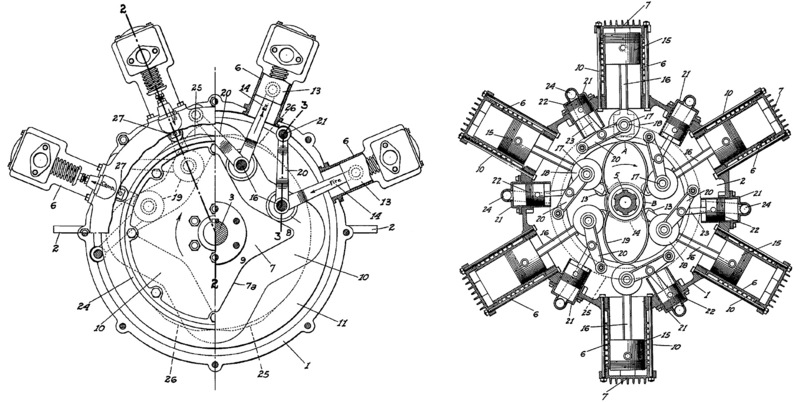 Still working with Nordwick, another patent was filed for an eight-cylinder radial with a two-lobe cam. A lever extended from the big end of each connecting rod and was attached to the crankcase. Also connected to this lever was an auxiliary piston. Fed by pressurized air, the auxiliary piston forced the connecting rod to be in contact with the cam at all times. One auxiliary piston was positioned between each main piston. Drawings from Nordwick and Marchetti cam engine patents. The patent for the four-lobe cam design (left) was filed in 1922, and the patent for the eight-cylinder engine with auxiliary pistons (right) was filed in 1924. Nordwick and Marchetti focused on inline engines in 1925. They designed a two-lobe cam engine, again using a lever extending from the big end of the connecting rod to the crankcase. That same year, Marchetti patented an inline engine under his business name: Marchetti Motor Patents. For this engine, the crankshaft throws were replaced with disks, offset to the crankshaft’s centerline. A connecting rod ran in a grove in each disk, and the disk’s offset would create the up and down strokes for the piston. The circular disk could also be substituted in favor of a lobed design for increased engine performance. In 1926, Marchetti took out a patent on an inline engine with a two-lobe cam driving the pistons. The connecting rods were paired together via a rocker so that when one piston was at top dead center the other piston would be at bottom dead center. This configuration was also suggested for a U engine with two separate cam (crank) shafts. Drawings from the Marchetti cam engine patents. The 1924 broad-arrow engine design is on the left, and the 1925 inline cam disk design is on the right. 1927 saw Marchetti focus on the business side of his dreams. His company, Marchetti Motor Patents, Inc., was officially formed with $2,000,000 of capital and operated out of the newly completed Russ Building, the tallest building in San Francisco until 1964. Marchetti worked on new engines and aircraft. In 1928, ground was broken for the Marchetti Motor Patents factory at Mills Field (now San Francisco International Airport). The factory had an expected output of 100 aircraft and 1,000 engines per year. With his business established, Marchetti designed and built a new cam engine. 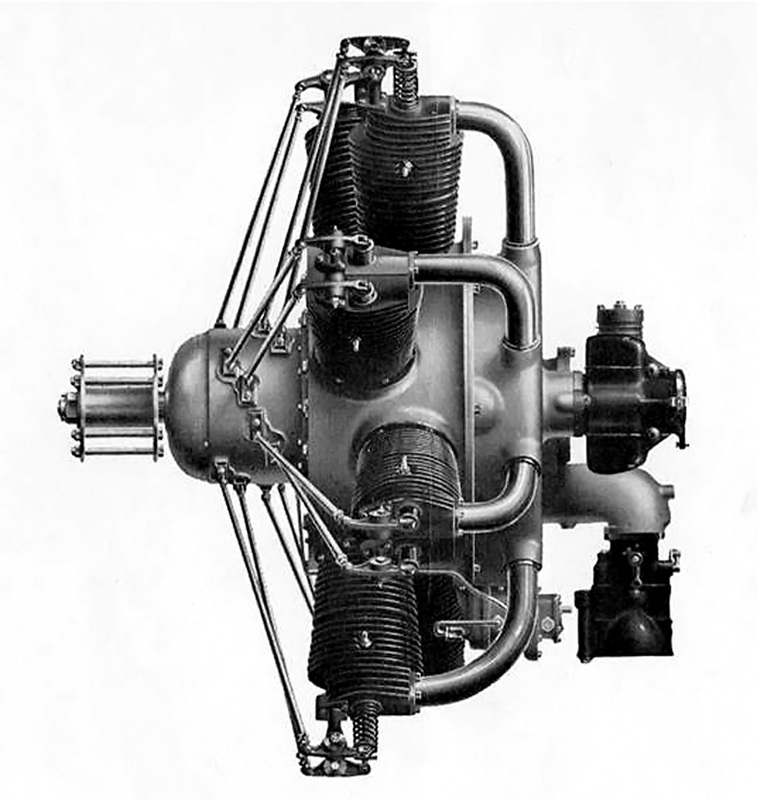 While incorporating some aspects of the previous engine designs, this engine also had some unique features that are not found in any of the patents filed by Marchetti. However, the connecting rod arrangement and cam were similar to those found in a patent filed solely by Nordwick in 1926. Marchetti Motor Patents Inc. advertisement from 1929. The new engine was an air-cooled, eight-cylinder radial. The cylinders were slightly staggered, making two rows of four cylinders. Twin two-lobe cams replaced the conventional crankshaft. Via roller bearings, the front cam actuated the connecting rods for the front cylinders, and the rear cam actuated the connecting rods for the rear cylinders. One fore and one aft cylinder were paired together by a common bell crank attached to the big end of the connecting rods. The center of this bell crank was the pivot point and was attached to the crankcase. The cams were staggered so that when one of the paired cylinders was at top dead center, the other cylinder was at bottom dead center. Since each cam had two lobes, there would be four piston strokes (or one power stroke) for each revolution. Marchetti referred to this design as a “cam-action” engine. Each of the engine’s cylinders had one intake and one exhaust valve at the center of its head. The valves were actuated by pushrods driven at the front of the engine. Two spark plugs were located just below the valves of each cylinder and were fired by a magneto driven from the rear of the engine. A carburetor attached to the lower rear of the engine fed the air/fuel charge into a blower (weak supercharger). The blower helped mix the air/fuel charge, which was then distributed to the cylinder via separate manifolds. The engine had a 4.0 in (102 mm) bore, a 4.25 in (108 mm) stroke, and a total displacement of 427 cu in (7.0 L). Initially, 135 hp (101 kW) was expected from the engine, but 160 hp (119 kW) was achieved after testing. The engine weighed 350 lb (159 kg). Cutaway view of the Marchetti cam-action engine. The rear cam can barely be seen in the rear of the crankcase. Note how each cam actuates one “row” of cylinders. The bell crank for the upper right cylinder pair can be seen clearly. The bell crank attached to the connecting rods and pivoted in the middle, where it was mounted to the crankcase. 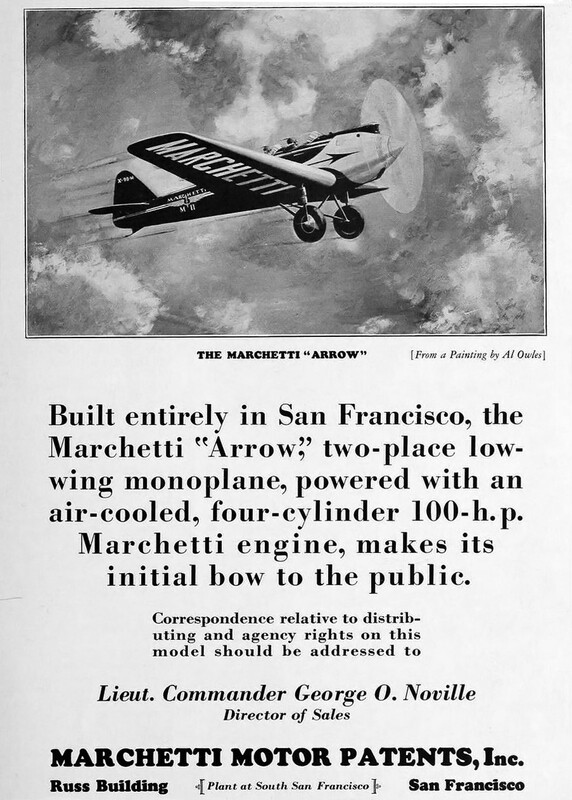 Advertisement from September 1929 for the Marchetti M-II Arrow and its four-cylinder engine cam-action engine. Another Marchetti aircraft was the M-II Arrow—a two-place monoplane to be powered by a Marchetti inline, four-cylinder, air-cooled, cam-action engine of 100 hp (75 kW). The M-II was constructed of wood covered by fabric. On the drawing board was the Marchetti M-III—an eight passenger, all metal aircraft intended for passenger service. It was to be powered by two Marchetti eight-cylinder cam-action radials. With his aircraft and aircraft engine manufacturing plans underway, Marchetti continued to chase his dream of becoming a pilot. On 31 August 1929, one week before the plant opened, Marchetti took off from Mills Field to look over his nearly finished factory and log some of the two hours remaining before he could get his pilot’s license. He flew into a fog bank, and what happened next is not known. A short time later, Marchetti’s aircraft was seen falling from under the fog bank in an inverted flat spin. The aircraft crashed half a mile (.8 km) from shore into San Francisco Bay. Rescue boats reached the scene as fast as possible, but it was too late. Marchetti’s body was found in the submerged fuselage. The Marchetti M-II Arrow was completed and flown, but it is not known which engine powered it. While it is possible that it flew with a Marchetti inline cam engine, it is more likely that another four-cylinder engine was installed. Marchetti’s grand aviation plans drifted into oblivion after his death. Marchetti Engine Patents Inc. was sold to William Rider and then resold to United Aircraft Sales where it faded to obscurity. What happened to the M-I, M-II Arrow, or any of the cam-action test engines is not known. It is believed that the M-III transport never progressed beyond the design phase. This entry was posted in Aircraft Engines, Between the Wars on 28 September 2014 by William Pearce. You may be interested in my friend’s website http://marchetti-engine.com. Wesley’s been making a compressed-air engine based on the Marchetti cam design and has been researching the dimensions of the original design with the aim to make a scale IC engine.